Top 10 Ways to Extend Your Season | Johnny's Selected Seeds. Season extension through protected cultivation — growing with methods and materials that moderate the weather — is a universally useful component of horticultural production. 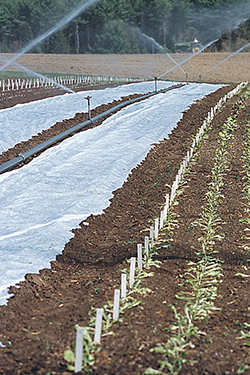 Hoophouses, low tunnels, row covers, and mulches are widely used on market farms because of the tremendous benefits they offer. You can use these materials and methods to harvest earlier in spring and later in fall, extend and stagger the harvest of most crops, improve quality, protect against pests and diseases, and increase yields. Most important, protected cultivation strategies can help you spread out your workload over a longer season. That means less stress and burnout in summer's heat, more enjoyable farming in pleasant weather. The ultimate goal, of course, is to increase revenue. Most growers who have adopted these practices are amazed at how much income can be derived from these inexpensive structures and products. Protected cultivation does add a level of complexity to a vegetable farm, but it's a challenge that most growers enjoy. You may need to adjust your thinking about some of the many elements of farming. The frost-free date becomes less important, while day length becomes more important. Large plantings can be replaced by numerous smaller plantings in various environments, or successive plantings. You may even start to grow crops that never succeeded before for you in the field. At Johnny's Research Farm in Albion, Maine, we are continually trialing products and varieties to identify the best combinations for protected cultivation. You'll find the season extension products you need here on our website and in the catalog. Below, we present 10 ideas for achieving season extension. These are suggestions for getting started — as you explore alternatives to field production on your own farm, you are likely to discover new ways to improve your crops, increase your income, and enjoy yourself more. Season extension materials can be used in many ways to moderate conditions and extend production across seasons. 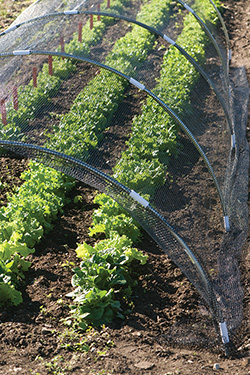 Plant cold-loving crops in a high tunnel in January and February, and cover with row cover on hoops. Seed leeks in a cold frame in January or February, and transplant them in a low tunnel as soon as the soil can be worked. Plant cool-weather crops in a low tunnel two to three weeks before you plant them unprotected in the field. Plant cucumbers and tomatoes in a high tunnel a month before field planting. Plant eggplant in low tunnels covered with lightweight row cover to protect against flea beetles. Put shade cloth on hoops in summer and plant heat-tolerant lettuces. Lay shade cloth on the soil for a week before planting fall crops, to improve germination while the weather is still hot. Keep heavy row cover on hand in case of a late (spring) or early (fall) frost. Plant spinach and carrots in the hoophouse, in quantities sufficient to harvest throughout the winter. Plant spinach in low tunnels to overwinter; it will resume growth in early spring and be the first crop of the new season.